Back in August, I ordered a Solidoodle Press on the day they were announced, for $349 plus $61 shipping. They were advertised as shipping in 6-8 weeks, but there were multiple delays. That's 23 weeks for those counting. At best I'd attribute it to serial optimism on the part of Solidoodle. Communication from the company was not very good (though it improved toward the end), so before even getting the printer, my first impression has not been good. I originally bought it because I'd heard good things about Solidoodle's other printers, and because I thought a buying from an established company would be avoiding these kind of delays. Anyway, with all that behind us, here it is! I'm geographically close to the warehouse they shipped from, so even though it went out on UPS Ground service, it arrived this evening, just one business day later. The box, larger than I expected. Bags of cables/tools on the left, box with power supply on the right. The contents, minus the power supply. There are three pieces of foam inside protecting the build platform, filament spool, and extruder. Top hatch and front door. One pound of ABS white starter filament. View with the spool tray lifted up. The extruder, looking pretty nasty right out the box. The Press was well-packed. The USB cable is blue and cheap-looking, but that's not a big deal. It was a little difficult to get a grip on the Press to pull it out of the box, so I just grabbed it from the bottom. Anyway, I'd like to go on and get printing, but the first step in the "Getting Started" booklet is to download and install the SoliPrint software, but at the time of posting (evening of Jan 12) the URL specified (in the larger manual booklet) yields an error! Maybe they didn't expect anyone to get their printer this early, but it is really disappointing that the software isn't ready after this many delays on the hardware. I've put in a ticket with Solidoodle Support -- hopefully I can get the software and start printing soon. Okay, it's now the morning and the SoliPrint software at the link above is live. Download and installation was straight-forward. I plugged in the Press power and USB and was met with the following message. According to the Press Getting Started and the Installing Drivers page it links to, this should have "just worked," but since it didn't I should download drivers, which is a hotlink to the PJRC Teensy drivers. Hooray! Now the SoliPrint software has recognized the printer and I'm heating up the bed. The lighting inside looks nice. The filament is already loaded so I'm skipping that step in the guide (even though the menu items are listed incorrectly). 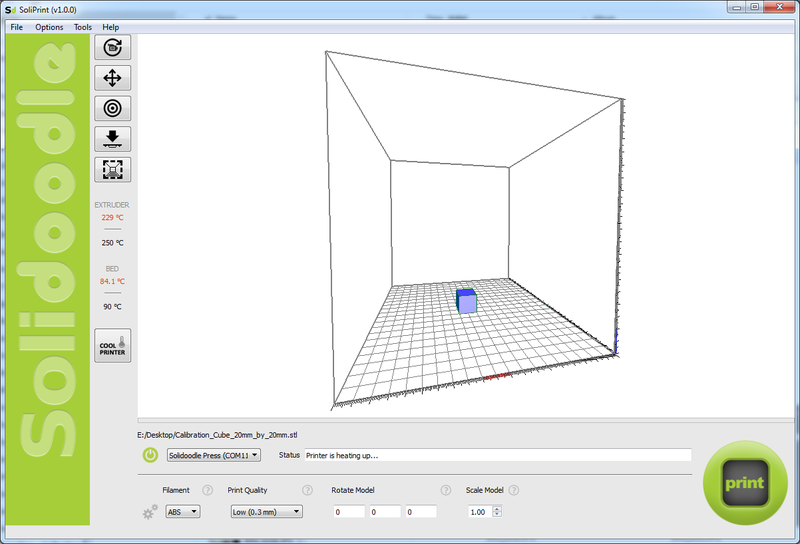 I had a ring-shaped part that I need to print for a project I'm working on, but I can't get any of my .STL files to load (currently listed as a known issue on the SoliPrint page), so I'm just going to print a calibration cube from Thingiverse. I'm using low resolution (0.3mm layers). Before printing, it wants me to set the Z offset using the enclosed instructions. There aren't any enclosed instructions as far as I can tell. I popped the switch down like it asked for, and then it went and did some calibration steps and printed out a few strips, which I assume correspond to the lines on-screen. The printer made horrible horrible sounds when each of the stages were up against their stops. Not sure if that is normal. Anyway, the Press is supposed to be really easy to use and calibrate, so I'm going to assume that it worked. It didn't leave the bed at a good height for cleaning off the lines, but I managed. Started the print, and now I see that it automatically deploys the Z probe and touches the bed at a few points prior to printing. Had a few more horrible horrible sounds but now it's making sweet stepper motor music as it goes along. Here's a clip of some of the first layer. And here's a clip of an intermediate layer. 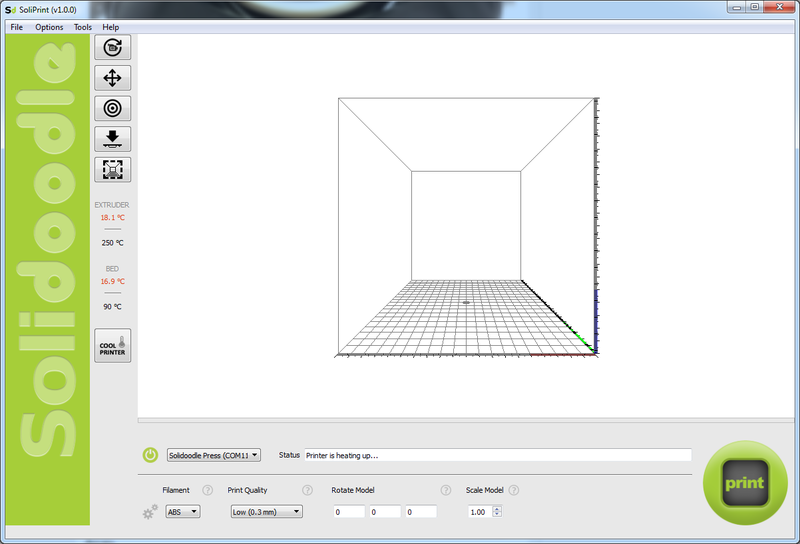 The whole time it was printing, SoliPrint showed an elapsed time, but after it finished, it disappeared. I'd estimate that the print took about 30 minutes. It's worth noting that after the print is complete, the bed and extruder don't cool down automatically. Finished print on the bed. Again, the bed didn't lower itself enough to make popping the printed object off easy, but it wasn't too bad with the included spatula. The print bed is covered in some sticky substance (that unfortunately grabbed some some of the packing foam particles in the beginning, which were a pain to clean off). Looks okay for the low resolution setting. Flare-out on the first layers is very noticeable here. Flare-out makes this measurement oversized. Either X or Y, forgot to keep track of it. Aside from the flare-out on the bottom layer, which can probably be fixed later with better settings, the print seems a-okay. I had meant to do the print on the highest resolution, but forgot to set it back to that after I closed the software once. Probably a good thing, since it would have taken much longer. It's too early to say a whole lot about the Press or give it a fuller review. I was disappointed that my STL files would not load, especially after they've had so long to work on the SoliPrint software, but hopefully that will be working soon. Also need to sort out the horrible horrible noises from the motors/belts at the stops. I've had some experience using MakerBots at work; this was not as easy as that, but it was also many times less expensive. Hopeful to do some more complex (and useful) prints in the near future. I got my mom an Acer Aspire V3-112P-P7LP laptop for Christmas, and of course had to replace the mechanical hard drive with a solid state drive. Anyway, I didn't see any pictures of the guts on the internet, so here's one (not quite a teardown). The hard drive is very easy to get to, just a bunch of small Phillips screws to get the bottom shell off. The mainboard seems ridiculously small but I guess that means I'm getting old. This should be almost the same as the V3-111P.